It’s hard to forget your first sight of Linlithgow Palace. Off the merkat, up cobbled Kirkgate, past St Michael’s, through the impressive outer gateway – and the palace fills your vision. It is massive, literally awesome, so obviously a ruinous shell – and yet there’s a niggling hint of what it once was, or might have been. While you wander round this slightly melancholy building on the shores of Linlithgow Loch, do phantom grand kings and courtiers drift through empty windows and draughty doorways, and glide between guileless guests? There is no sensation that Linlithgow is haunted – though the ghost of Mary of Guise, French wife to James V and mother of Mary, Queen of Scots, is said to turn up occasionally; it is merely that, despite the roofless rooms and algae-covered walls, you feel it could, somehow so easily, all come bursting back to life. This was the great palace of the Stuart monarchs, birthplace of Mary, Queen of Scots; it could have been – and maybe sometimes was – Scotland’s Hampton Court. 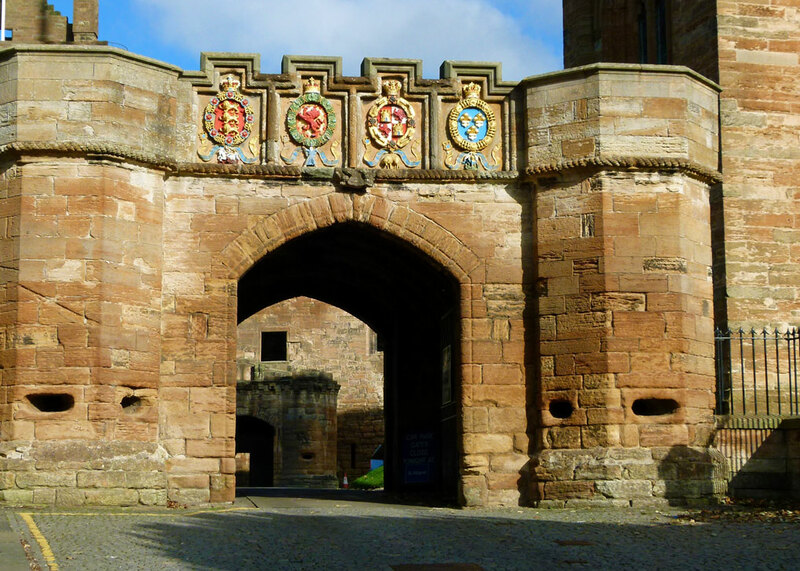 Linlithgow’s roots may lie in prehistory, but we do know it had a royal castle or fortified house during the reign of King David I, in the 12th century. In the 1300s, during the so-called Scottish Wars of Independence, the English King, Edward I, developed a supply base and stronghold on the site. An enormous ditch was excavated across the outcrop it stood on, separating the castle and church from the town. Behind the ditch, the English built a stockade, known as a pel, or peel – the name used today to refer to the parkland around the palace. The Scots captured Linlithgow in 1313 and in the following year decisively defeated the English at the Battle of Bannockburn. 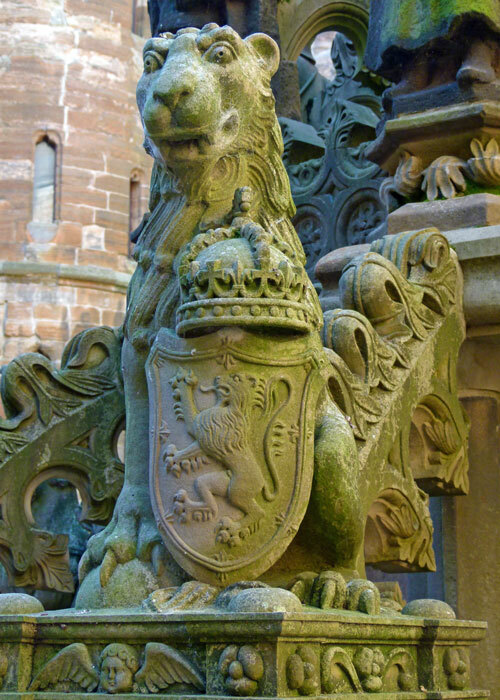 Once again, Linlithgow could be a residence for Scottish monarchs. King David II held court there and the Parliament that met at Linlithgow in 1371 elected the first Stuart King, Robert II. Then, in 1424, disaster struck; an enormous fire broke out in the town, engulfing the castle and church. James I returned to Scotland that year from a long captivity in England, bringing his English bride, Joan Beaufort, with him. Some of James’s enemies were suspicious of English influence, but James decided to make a statement for the benefit of all his subjects. He would demonstrate the power and magnificence of his kingship by constructing a grand palace on the smoking embers of the castle at Linlithgow. 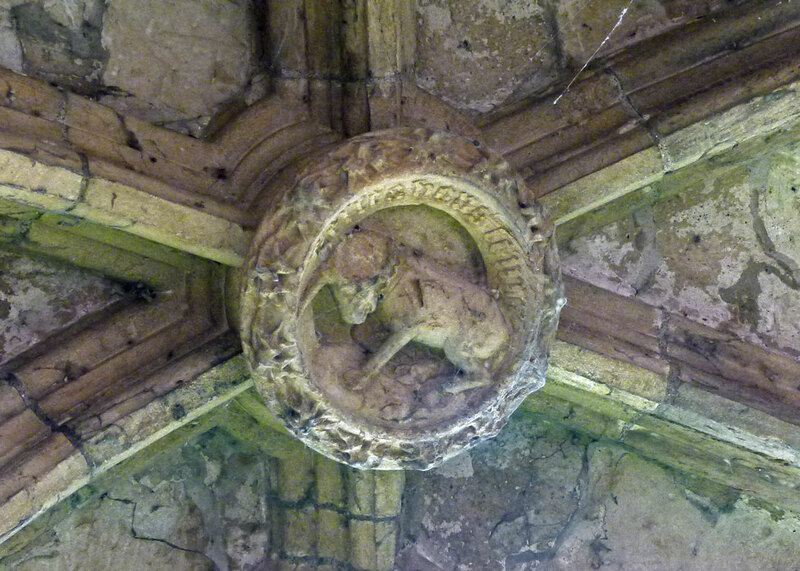 Work began in 1425, though it was discontinued after James was murdered in Perth, in 1437. His son, James II, apparently showed little interest in the project, but his grandson, James III (1460-88) took up the reigns. 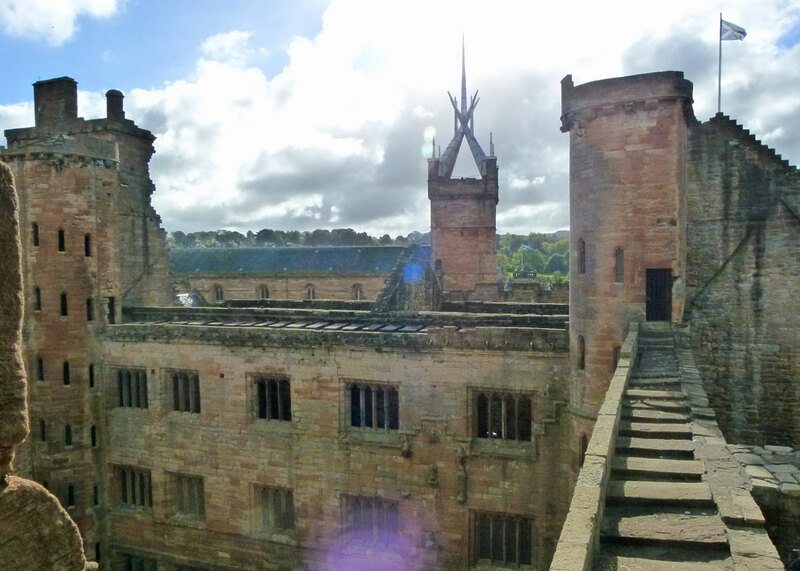 It was his son, James IV, who finally completed the dream by linking all four wings, or ranges, around a central courtyard and installing wide spiral ‘turnpike’ stairs at each of the four corners. 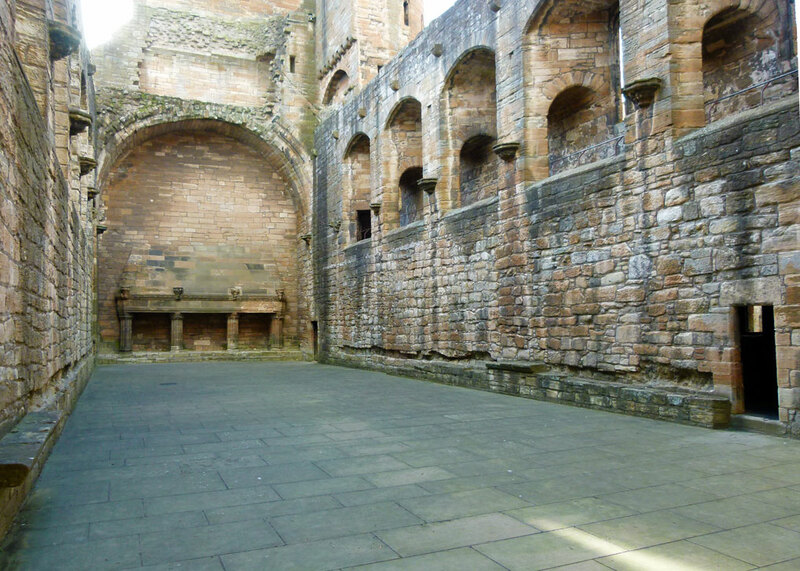 Linlithgow Palace was a renaissance jewel. James gave it as a wedding present to his bride Margaret Tudor, daughter of England’s Henry VII and sister to Henry VIII. The marriage was one outcome of the Treaty of Perpetual Peace, signed by James and Henry VII in 1502, a peace broken in 1513 when James declared war on and invaded England in support of Scotland’s auld alliance with France. 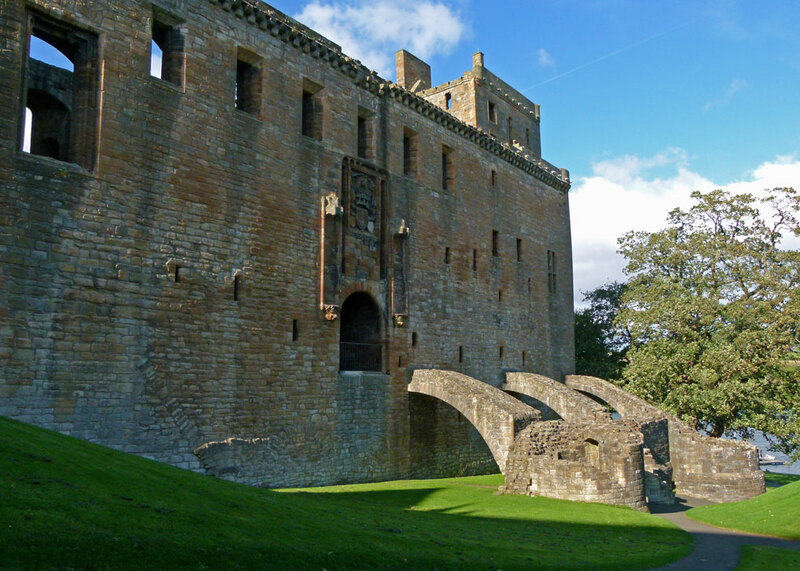 Tradition is that Margaret occupied a small room in the north-west tower of Linlithgow, where she anxiously waited her husband’s return. He never did; James was one of about 10,000 Scots, including the cream of Scottish nobility, that perished at the Battle of Flodden in Northumberland. Margaret and James’s great-grandson, though, would become James VI of Scotland and, in 1603, James I of England – irrevocably unifying the two crowns. 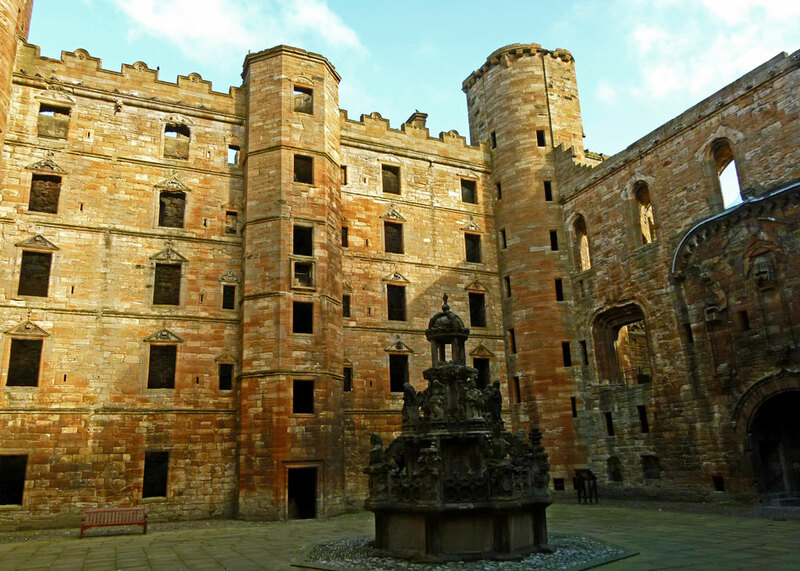 Linlithgow was possibly disused until Margaret and James’s son, James V (1513-42) came of age. He added the grand gateway and the totally over the top fountain – which, it is said, flowed with red wine on special occasions; it must have looked astonishing – especially as it was richly painted at the time. 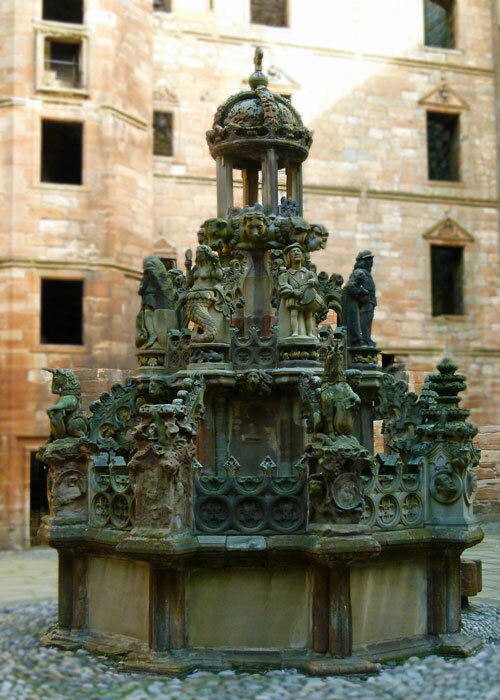 The fountain dominates the courtyard. It is a statement, full of symbolism and, likewise, James further declared his power and authority on the gatehouse by displaying the badges of the four orders of chivalry that he belonged to: the Garter of England, the Thistle of Scotland, the Golden Fleece of Burgundy and St Michael of France. Mary of Guise pronounced Linlithgow to be the equal of any chateau in her native France. But it was once again largely abandoned by the royals on James’s death. The infant Mary was taken to Stirling Castle for safety by her mother, and only returned to Linlithgow 20 years’ later. Her last stay was in 1567 – the year she was abducted and imprisoned. 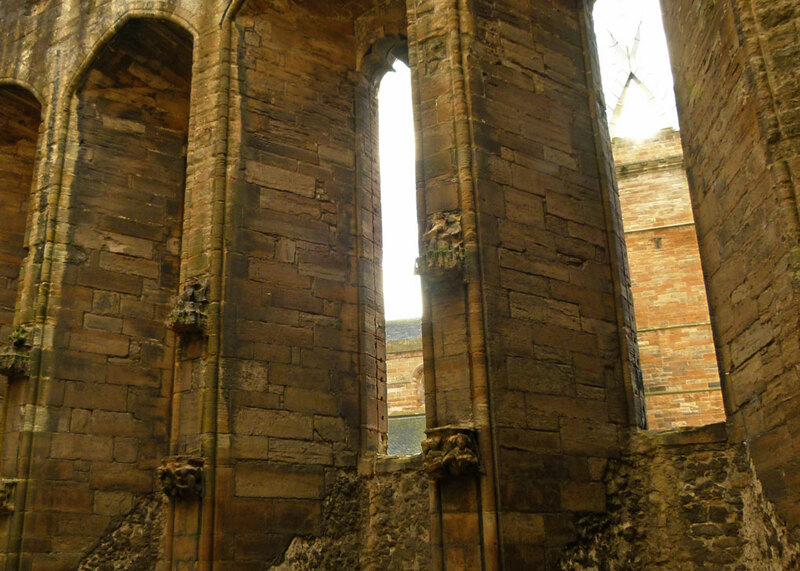 Her son, James VI, used Linlithgow – but by this time it was in a very poor state of repair. His master of works informed His Majesty that the west range was “altogidder lyk to fall down”. In 1599, the Palace was reported as “a quarter ruinous and the rest necessary to be repaired”. In 1607, the north range collapsed. By this time, after all the vicissitudes of the Scottish kings, power had shifted south, to England and London. On the death of the English Queen Elizabeth I in 1603, James VI also became James I of England. 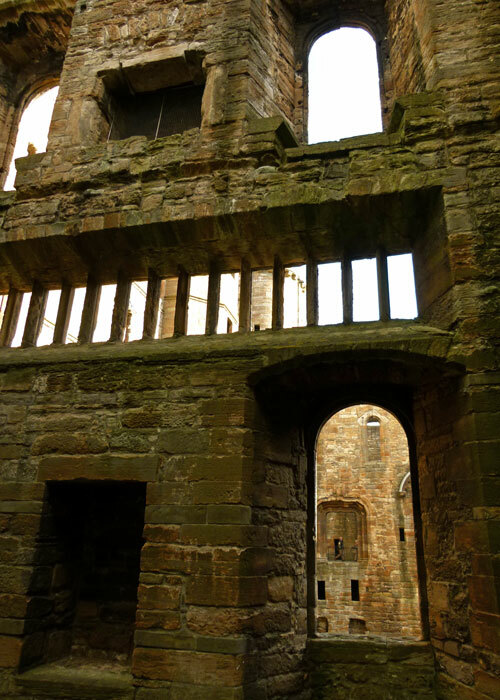 He did return to Linlithgow and authorised the building of new north range in 1620, which included fine fenestration and a fashionable long gallery. But James never saw the work completed. The last reining monarch to stay there was his son, Charles I, who spent just one night at the Palace in 1633 following an absolute fortune being spent on its – and the town’s – refurbishment. Lord Protector Oliver Cromwell resided at Linlithgow during his Scottish campaign (1650-51), his troops camping in the peel. Less than 20 years’ later, the Palace was declared mostly ruinous. Despite that, the Duke of York – later James II – stayed there for a period in 1679. Deserted and decaying, Linlithgow’s coup de grace was delivered in 1746. Government troops, pursuing Bonnie Prince Charlie and his rebel army, camped there. A fire broke out as they left – it may even have been arson – and the palace sadly and finally met its end. It seems an inglorious conclusion. 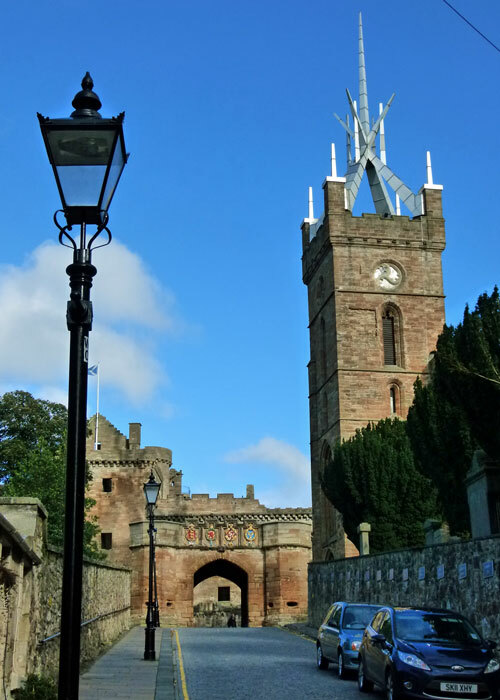 The splendour of Linlithgow spanned a relatively short time – just 200 years – but what a place it was! Photographs can barely hint at the luxury of the it – you have to imagine exquisitely panelled walls, hung with pictures, decorated ceilings, roaring fires with magnificent surrounds. 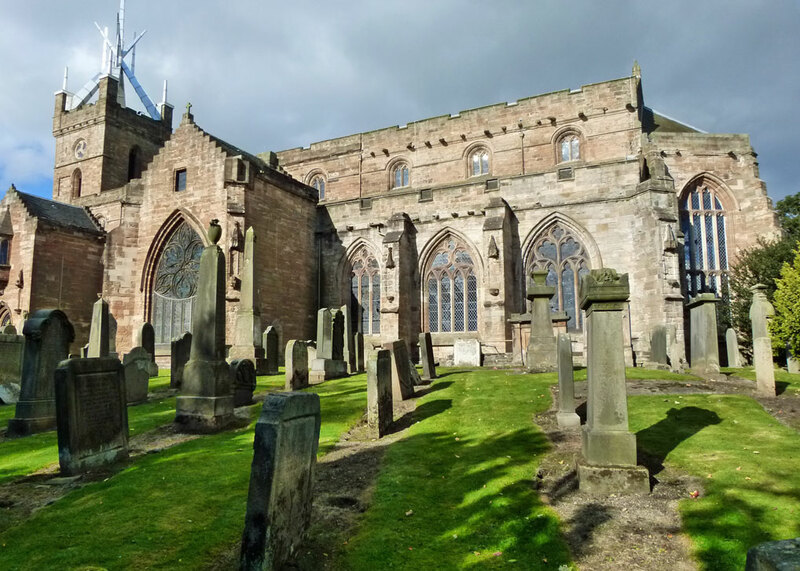 Linlithgow’s somewhat erratic fortunes (and clearly inconsistent maintenance) stemmed from the volatile and unstable nature of Scottish politics. But perhaps it was also a victim of royal power becoming centred in London. 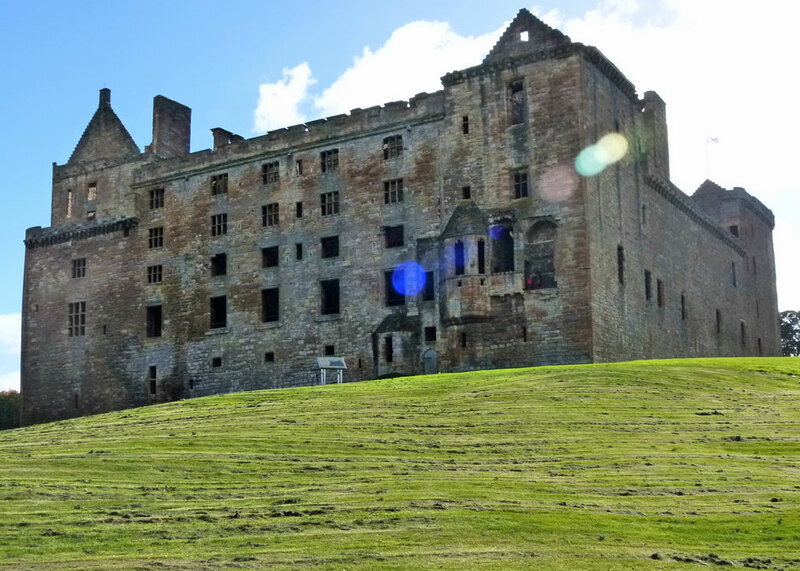 Maybe, had times been kinder to the Stuart monarchs and had Elizabeth I of England had an heir, there would still be a Royal Palace at Linlithgow to rival anything in Europe. Still wonderful even in decay! I had read the name of the castle but I never had the curiosity of googling it, so I had no idea it was still so beautiful. Thanks for sharing! It’s a lovely place and also a great setting with the easy mile long walk around the small Linlithgow Loch a highlight for the views of the palace with new sights round every corner. Best little loch walk in Scotland for variety and a history tour of the town. I can see how magnificent it once was, such a shame that it was left to ruin. That is a statement fountain, I like the lion with the slightly startled/fierce look on his face. Oh! So nice to see a place we’re familiar with. We’ve stayed in B&B’s near Linlithgow three times on our trips to Scotland and England, and really enjoyed it. Great location for riding the train into Edinburgh and avoiding the traffic! The palace is amazing to see in person, (as well as St. Michael’s Church next door), and your selection of pictures is great. I’m just finishing giving 6 lectures on ‘Great Scots’ for a Life Long Learning Series, which of course featured Mary Queen of Scots, as well as James VI & I. Really enjoyed this post, great memories. This is such an enormous place! What a shame it fell into disrepair. Beautiful photos and a fascinating account of this palace. I loved it. You are so right about being able to tell how magnificent it once was. My favorite is the Great Hall. Adding to the list … to visit. Mike, my boys asked if you have posted about Edith Cavell? If you have not, they have requested that you do. If you have, could you send me the link to the post. Hi Carla – hope the email exchange gave you what you wanted. “A niggling hint of what it once was”, that is the best description I have ever read of a ruin. It must be so impressive to see this in person, thanks for this post and your photos. This will be on our list to visit come September. I have never been. Thanks for the wonderful history and photos. It must have been quite a sight in its day. Even in this state, it is impressive!